Tastemakers How Does Aaharn's David Thompson Keep His Faith In Thai Cuisine? 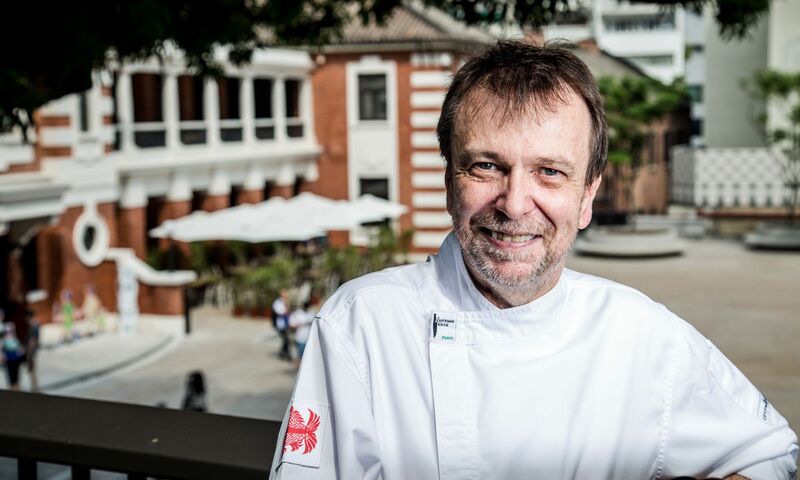 The day David Thompson was in town to check on the progress of Aaharn, his new Thai restaurant at Tai Kwun in Hong Kong, the Armoury bar was packed with thirsty guests, while the Aussie chef shared his story with us over coffee on the first-floor restaurant terrace. “ We are setting up our restaurant in a space where we know exactly how much it costs us, with little worry on the landlord’s rapacious demands. If you get a closer look at this space, a bridging stage between the swing and sway of parties at Soho and Central. What’s not to like?” Thompson exclaimed. Unlike his more famous establishments such as Long Chim in Australia and Bangkok’s Nahm—which he departed early 2018—Aaharn takes on a different route. “Aaharn is not meant to be something really forward or rigid sticking to the original Thai cuisine repertoire,” he explained. “We are stripping down every bit of description to the core. In one simple sentence: Aaharn is about serving some really good Thai food. It is not going to be as complicated as Nahm. Aaharn is not meant to be something really forward or rigid sticking to the original Thai cuisine repertoire. We are stripping down every bit of description to the core. Thompson never shies away from his opinions on lists and accolades, including his previous honours with Nahm topping the list of Asia’s 50 Best Restaurants in 2014—but he has his own perspective on success. “For the business these awards and accolades are very good, but mind you, chefs should never lose sight on the reason of why they are in the business in the first place. Once you believe these awards are what you are after, you start to alter your work and down the spiral of prostituting yourself for the approval. You lose sight of why you enjoy what you do in the first place because you are too busy feeling warm and gratified. The real accomplishment should lie within yourself, as do I, that we wake up every day enjoying what we do and how much we want to do what we are good at doing.” Thompson explained. Authenticity is fundamental and rudimentary. I consider this word associated with danger and problems, which is why I always prefer to use the word ‘faithfulness’ instead. Guests may feel lucky spotting Thompson strolling through the dining room at Aaharn, as the Aussie chef usually stays hidden in the kitchen. “Like all of my other restaurants, when I’m there, I will be inside the kitchen a lot.” He jokingly shared a special tip for guests looking to lure him out beyond the pass. “I love sweets, and increasingly so. I’m not just preferential to the sugar and coconut cream in Thai desserts. Sometimes a bar of chocolate is enough to bribe me over. If you show up with a bar of chocolate for me, I can be bribed too." And now, the secret is out, all the chef desires is a sweet deal with something as simple as a chocolate bar. Simplicity, as it turns out, is all over Aaharn and embodied by the visionary behind it. Digest Who's The Most Popular Pastry Chef On Instagram Right Now?